Wearing velvet jackets and blazers are more fun than you ever imagined when you let Contempo show you the way. 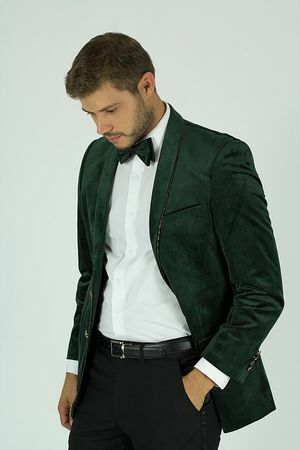 You can wear these stylish velvet blazers either with designer style jeans for a club friendly look or dress it up tuxedo style for your formal style look. This rich looking green velvet blazer comes in a 2 button style that has side vents and round shawl style collar with a rhinestone piping trim. Final Sale. Sorry, No Returns.